Second Chances were the spotlight at the Last Kiss of Summer Gala in Georgetown. Cynthia Carter, Second Chances Client and Speaker. Photo courtesy of Freed. Lights were low and spirits were high at the Georgetown Four Seasons last Thursday, but the guests weren’t focused on each other’s finery. Instead every set of eyes was fixed to Cynthia Carter as she took to the stage and explained how she had benefited from the work of Second Chance . 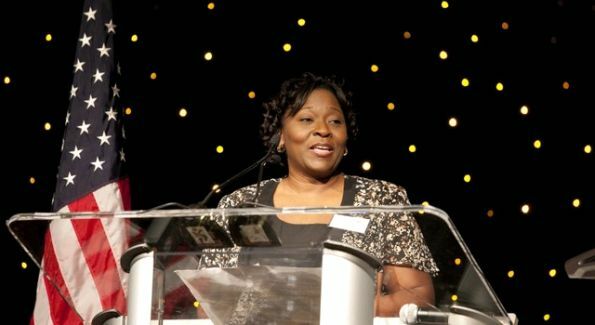 At the podium for the organization’s Last Kiss of Summer Gala, Carter described how Second Chance Employment Services transformed her life, and the lives of hundreds of at-risk women, by helping her find a lasting, satisfying job. Second Chance founder Ludy Green with Keynote Speaker Katie Hnida. Photo Courtesy of Freed. Carter wasn’t alone in lauding the organization- keynote speaker Katie Hnida, emcee and local sports reporter Brit McHenry, and congresswomen Jan Schakowsky all stepped out in support of the cause. And the night wasn’t only about second chances! Guests also sipped martinis before hitting the floor to dance the evening away. So here’s to Second Chances- and to hoping their next gala is as big a smash as this one. Brit McHenry, Gala Emcee and WJLA Sports Reporter. Photo Courtesy of Freed. This gala was beautiful! Dr. Ludy Green is a class act and has a heart of gold! I am proud to have attended such a great cause for women around the world.